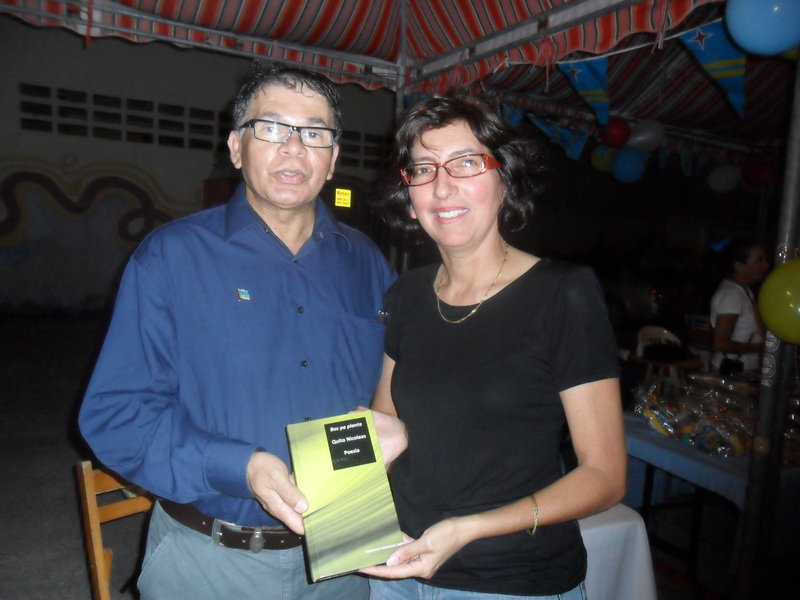 BookIsh Publishers is very delighted to announce that the president of the Dutch Parliament – Mrs. Gerdie Verbeet – quoted one of the poems from the volume Bos pa Planta [Constructing Voices] by Quito Nicolaas during her speech last Wednesday October 25th during the Aruban Parliament meeting at the occasion of the celebration of 25 years Status Aparte of Aruba. 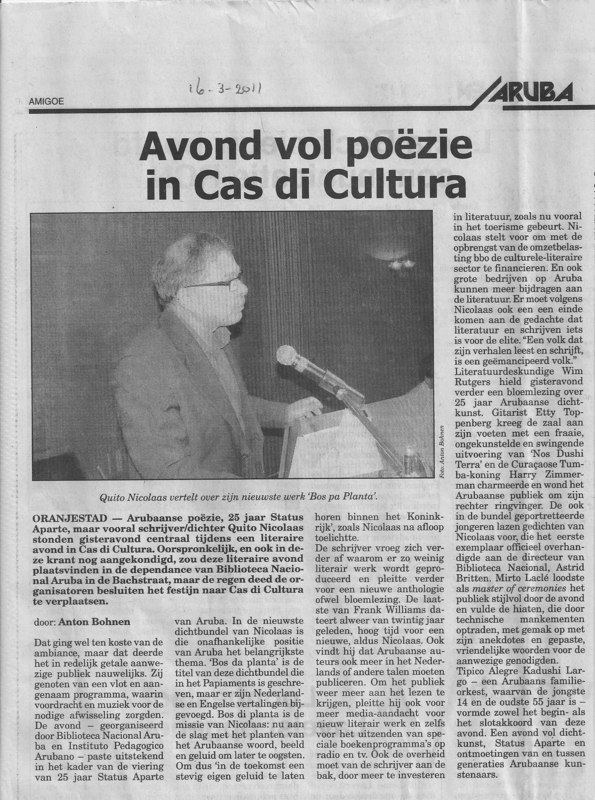 The author is very honoured after hearing of this. 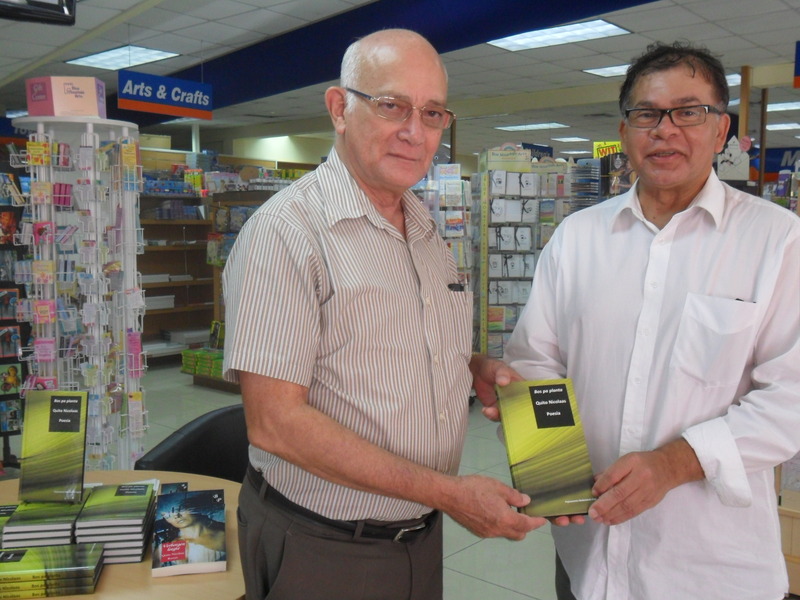 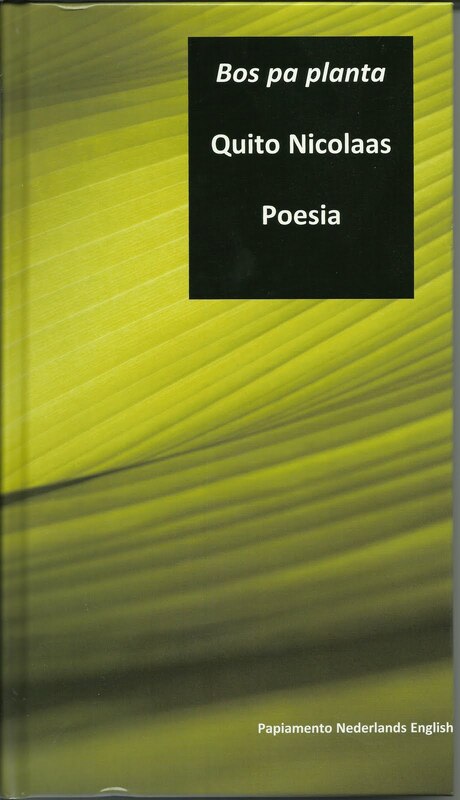 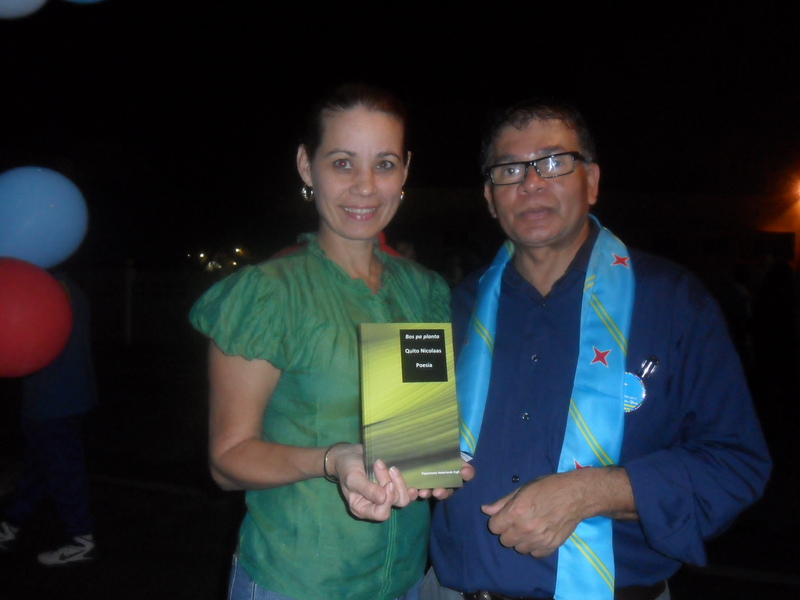 Bos pa Planta [Constructing Voices] is a poetry book written in Papiamento, with a translation into Dutch and English. 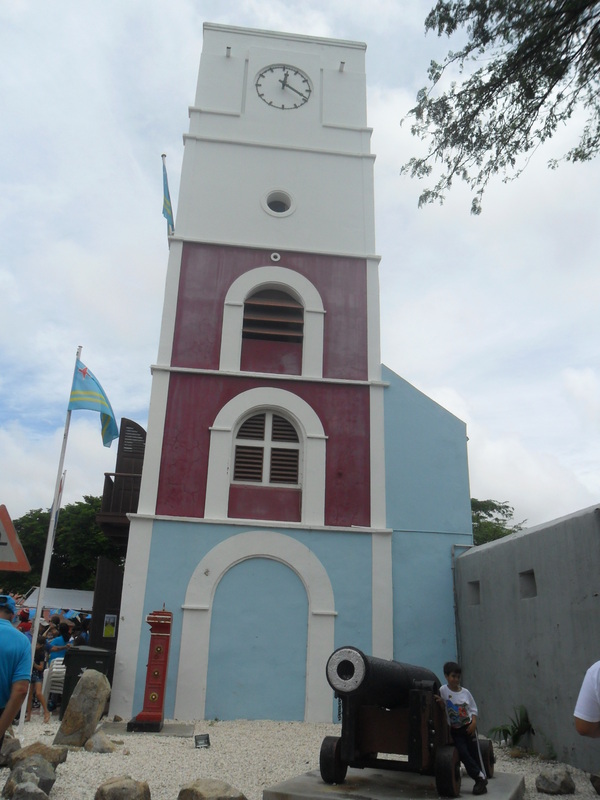 Papiamento/u is the language spoken on the Caribbean islands of Aruba, Bonaire & Curaçao. 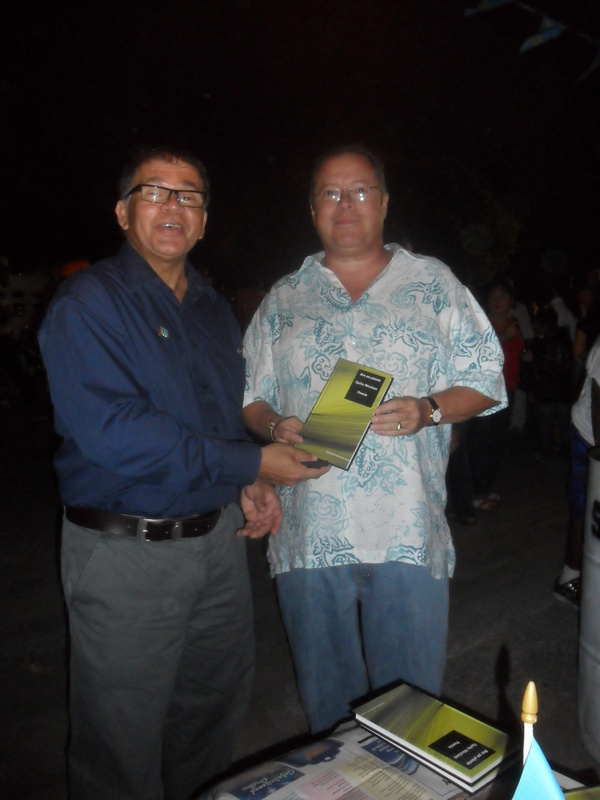 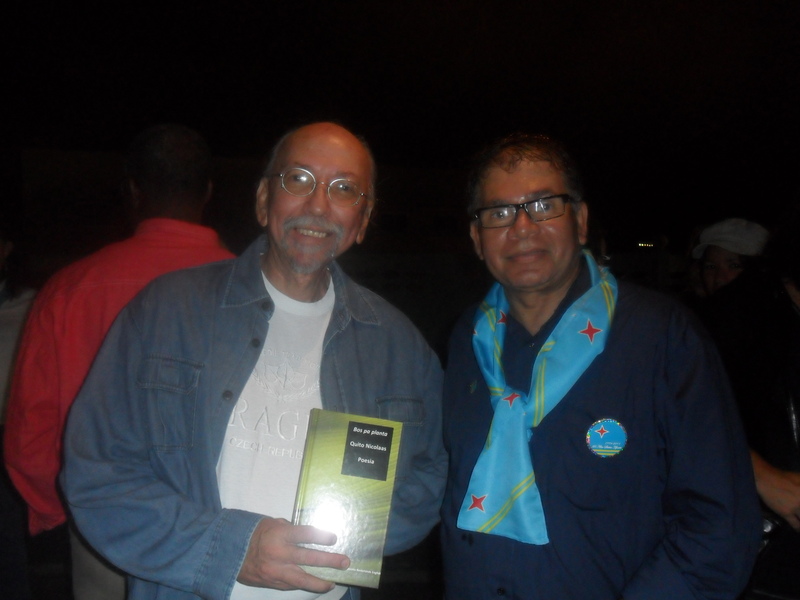 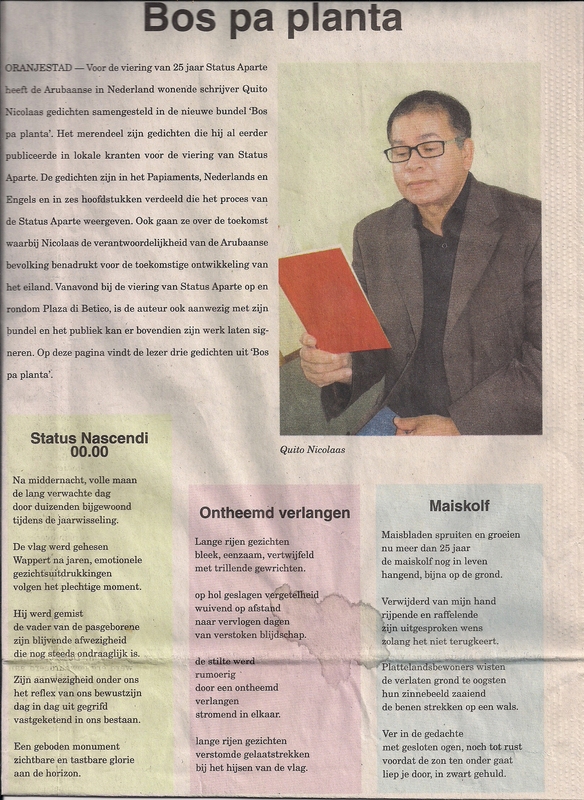 Writer/poet Quito Nicolaas got interviewed spontaneously on his latest poetry book Bos pa Planta when visiting the activities at the Historical Museum in Fort Zoutman. 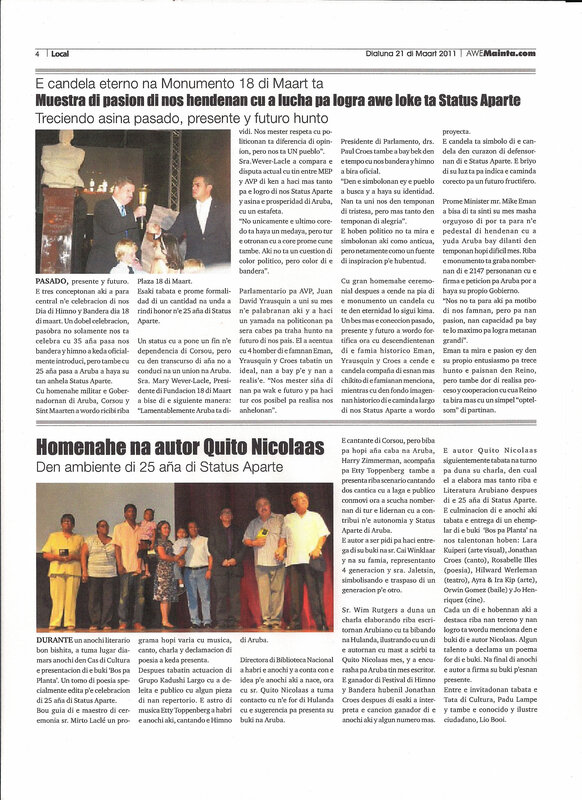 The interview was taken by colleague writer Desiree Correa. 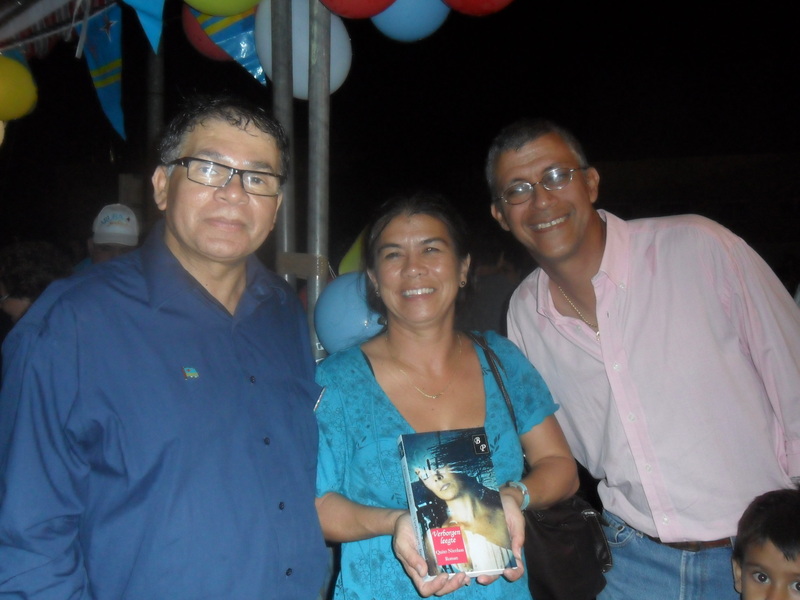 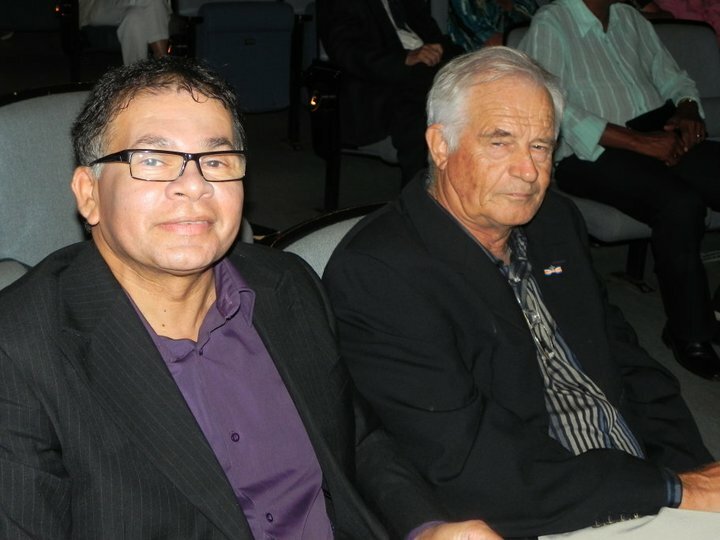 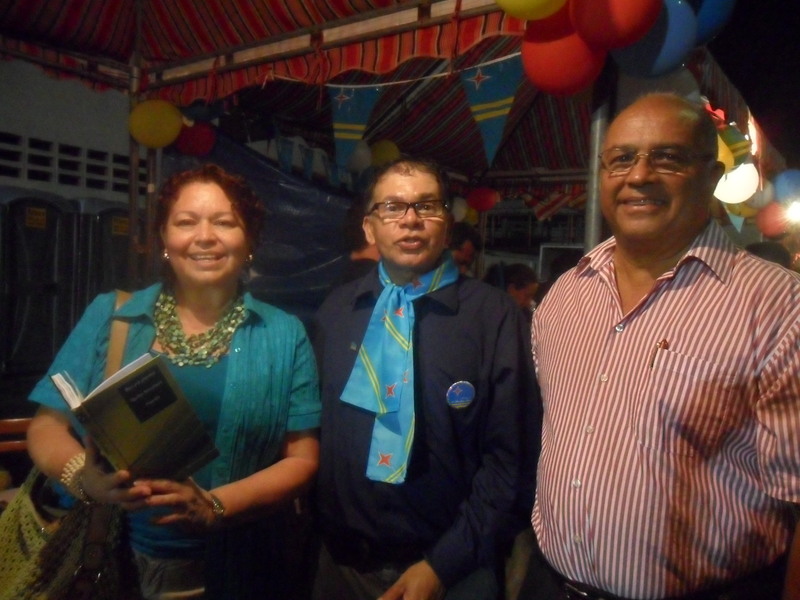 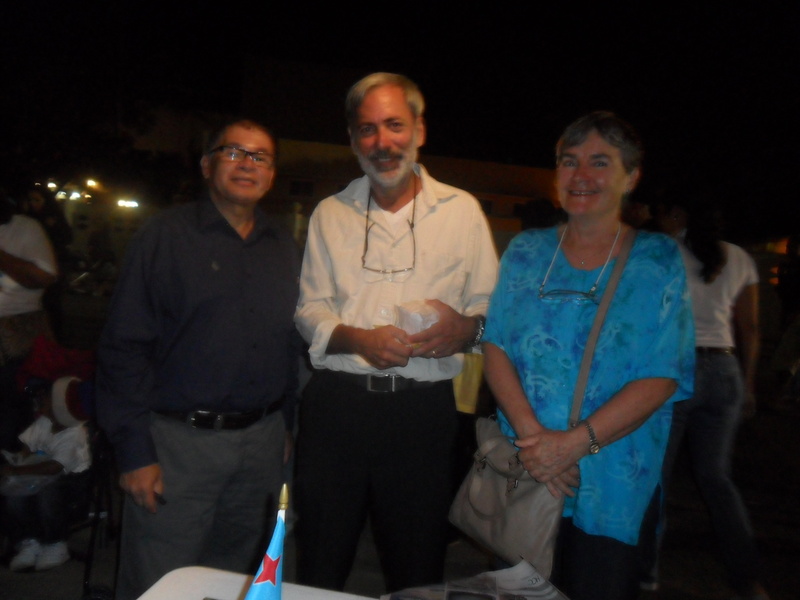 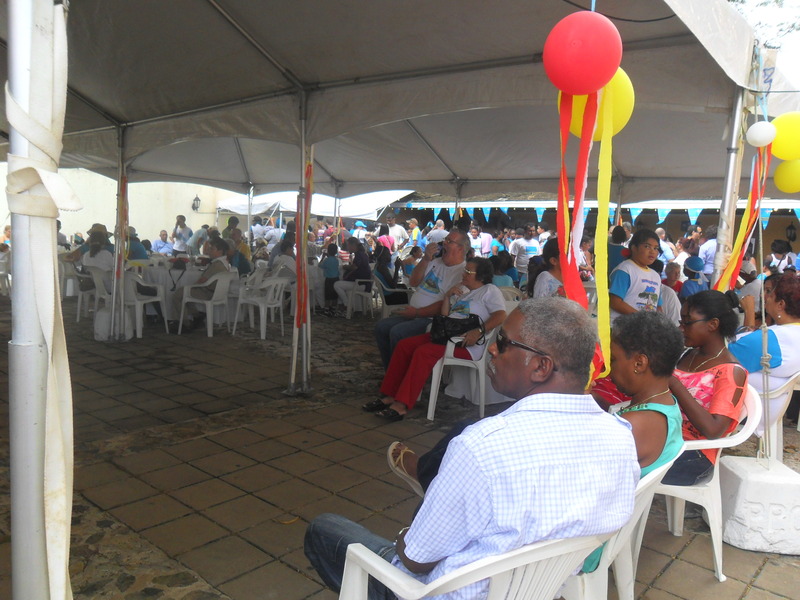 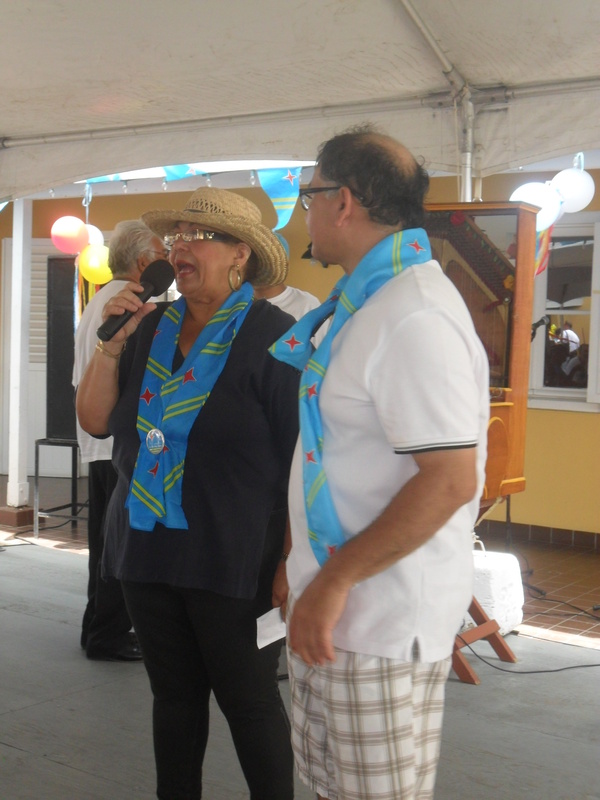 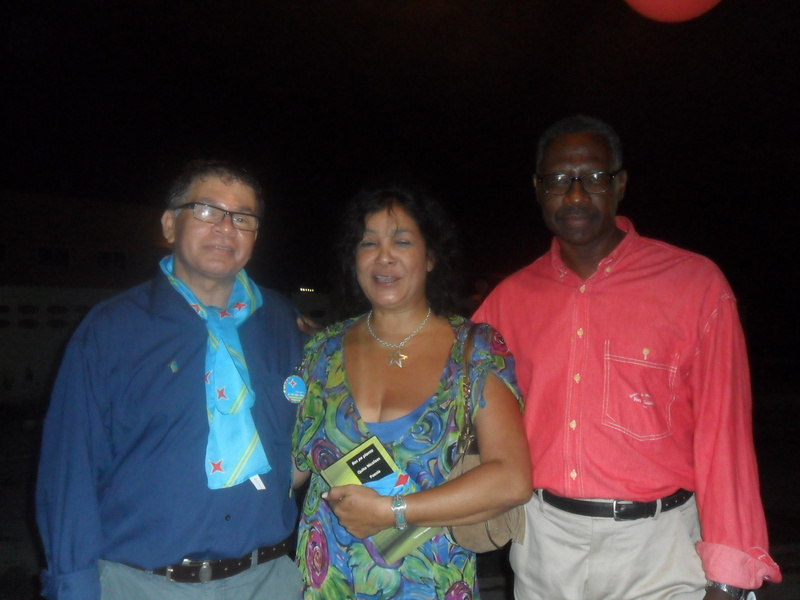 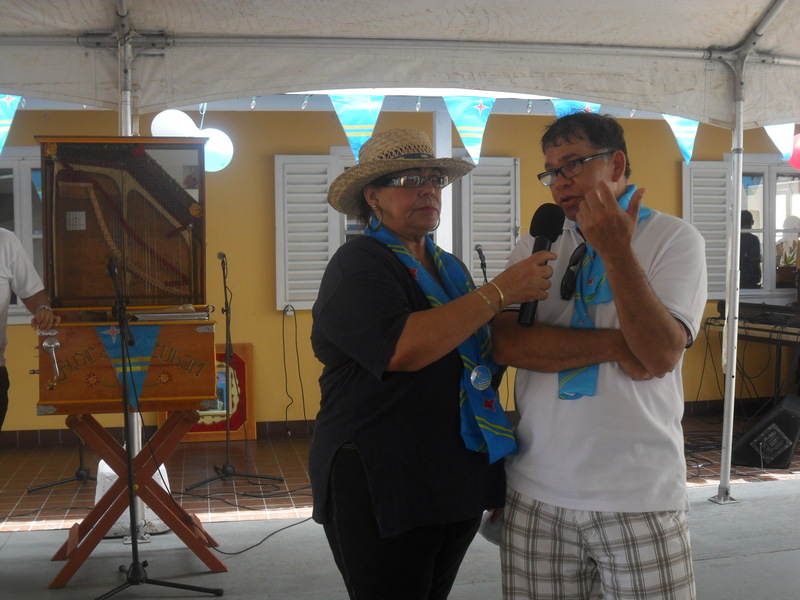 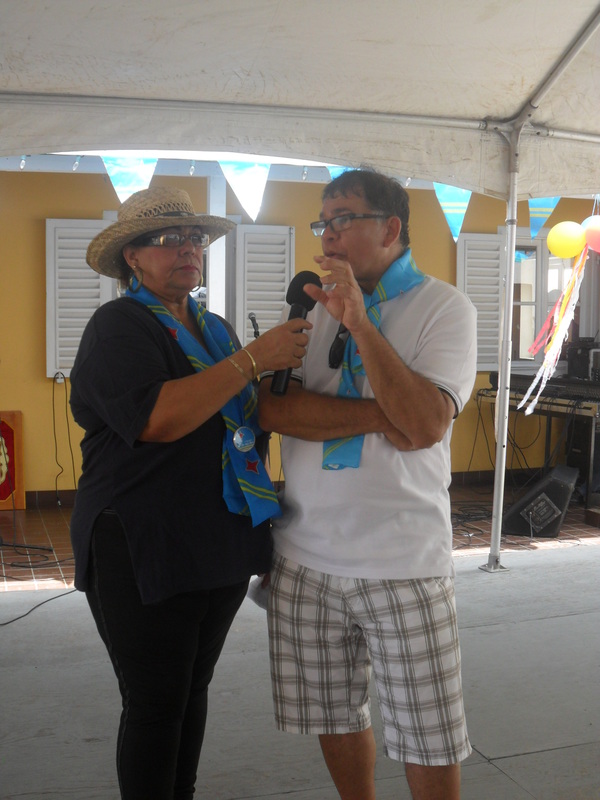 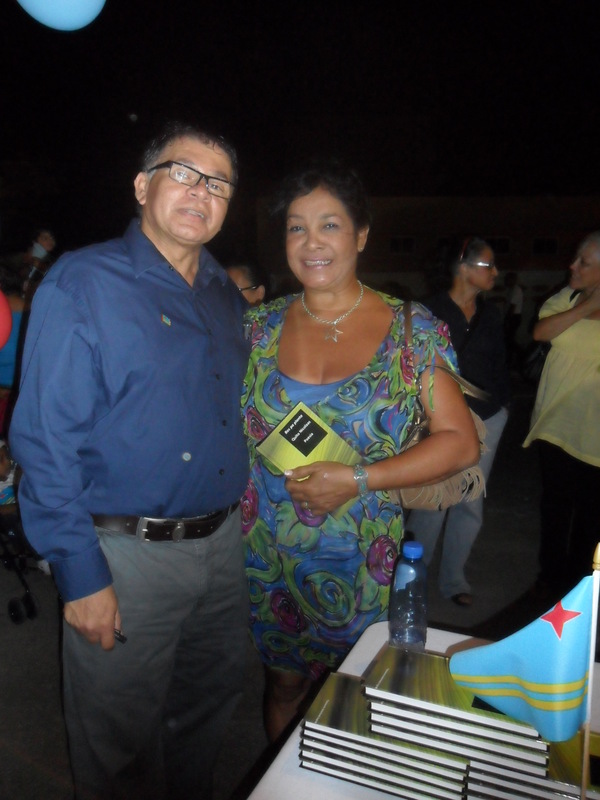 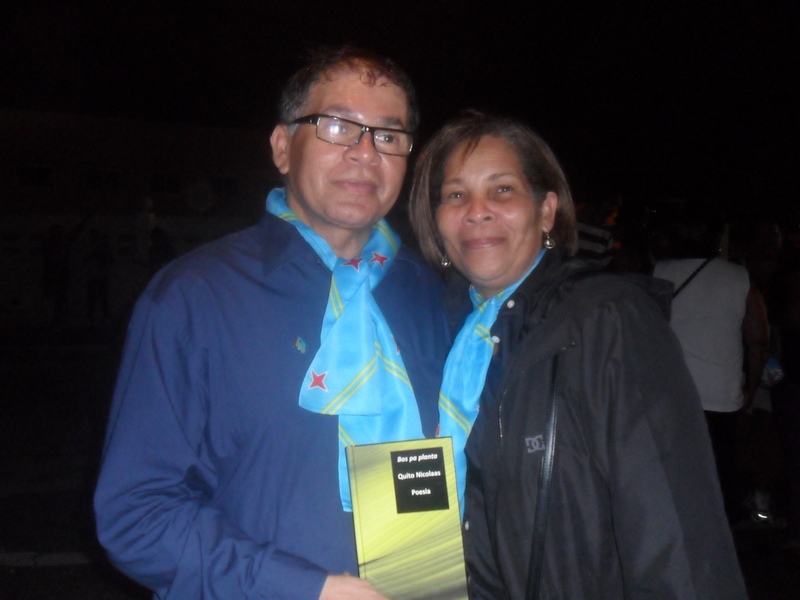 The fair ‘Feria Dushi Tera’ last thursday 17 March was at the occasion of 35 years Himno y Bandera (National Anthem and the Flag) and 25 years Status Aparte of Aruba. 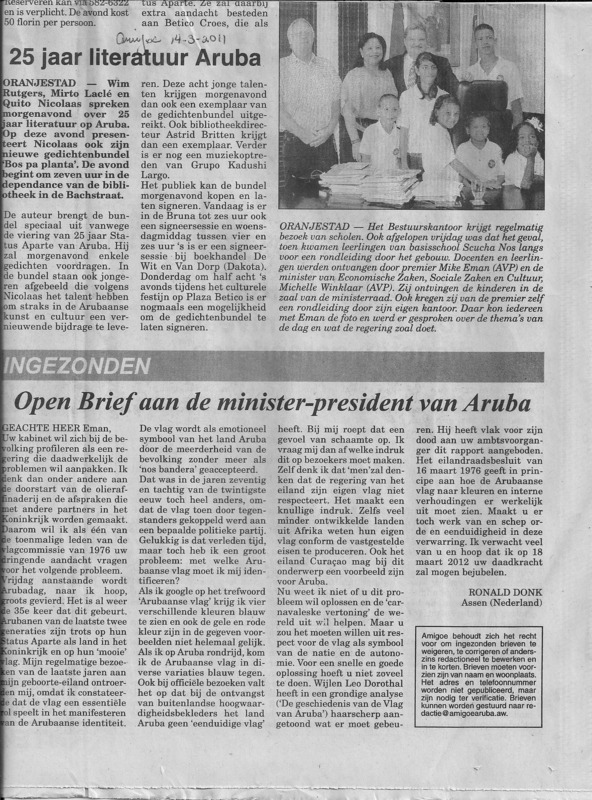 Aruba is the first island in the constellation of the Netherlands Antilles to have gained in 1986 it’s own semi-independent status in the Dutch Kingdom. 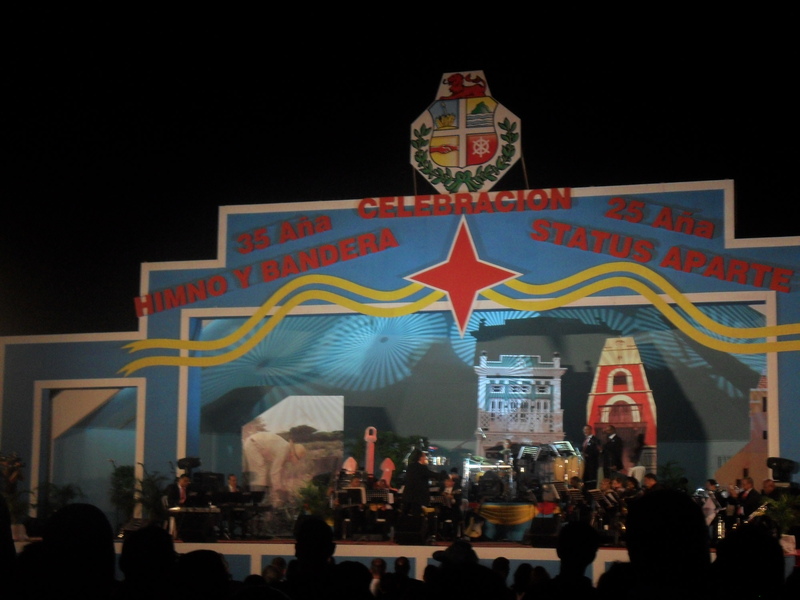 Each year this fact is being celebrated on 18 March. 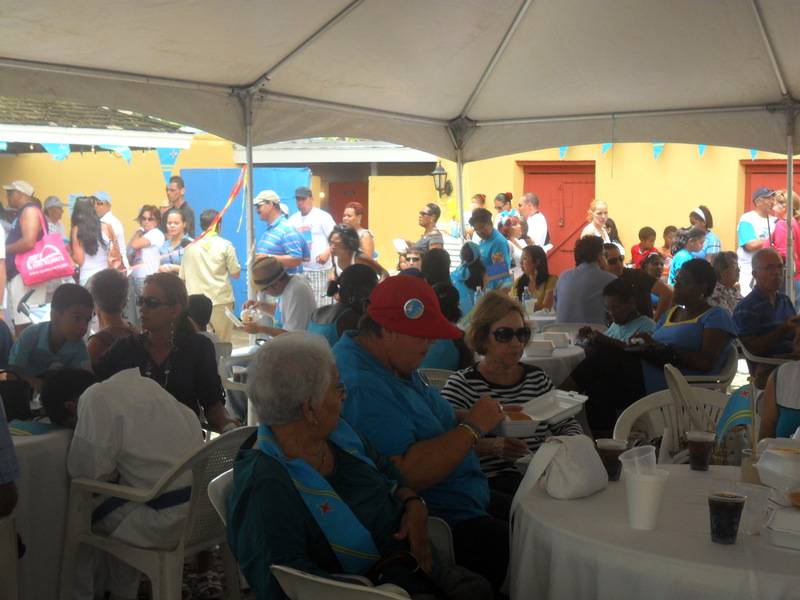 The fair was buzzing with people from all over the island. 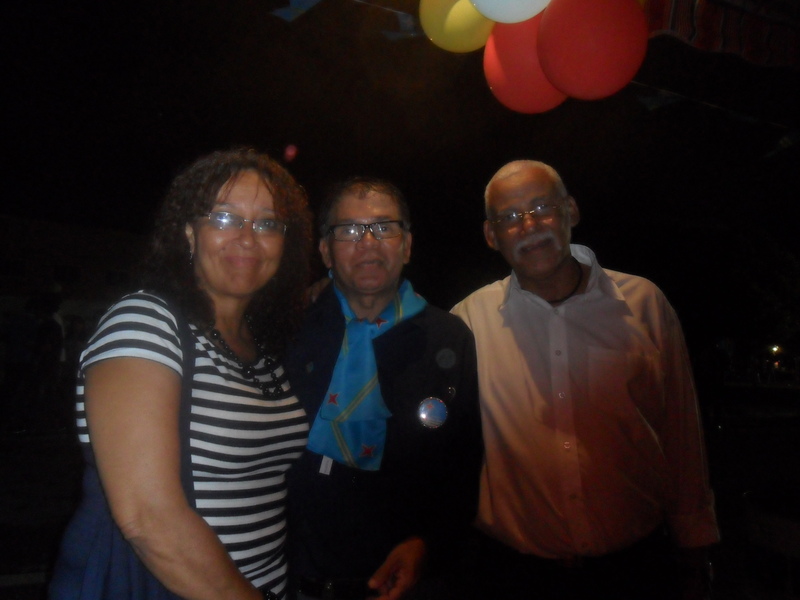 It was a great night with all kinds of goods in the colors of the beautiful flag of Aruba, delightful music, nationalistic speeches, typical dishes and the festivity was closed by wonderful fireworks. 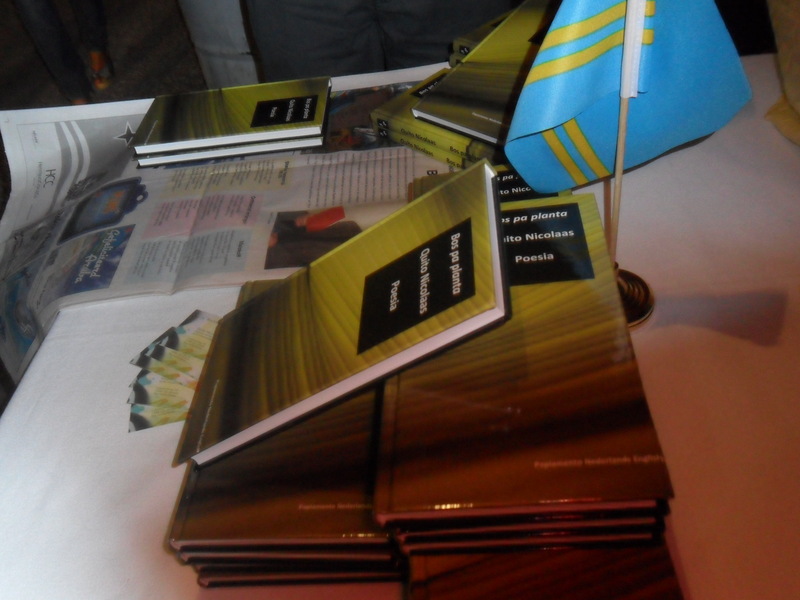 Bookish Publishers had it’s own stand nr. 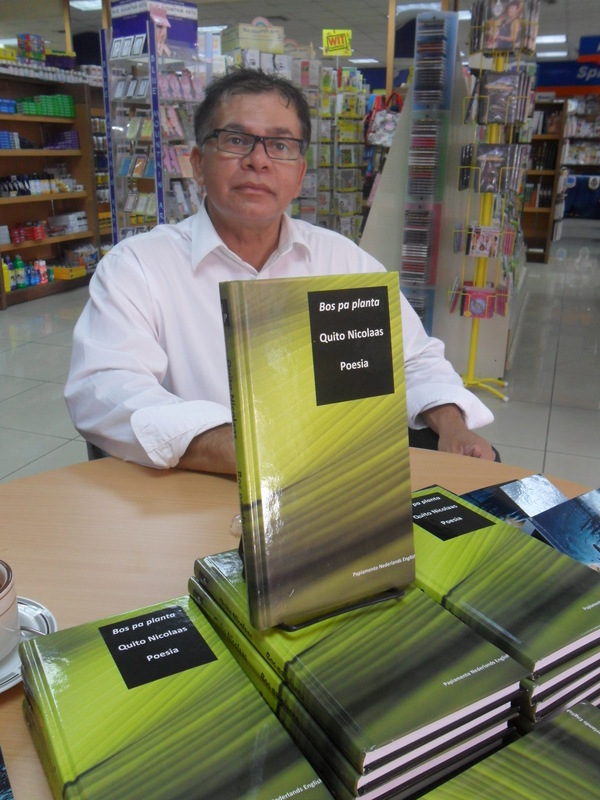 29 and people could meet&greet the writer Quito Nicolaas. 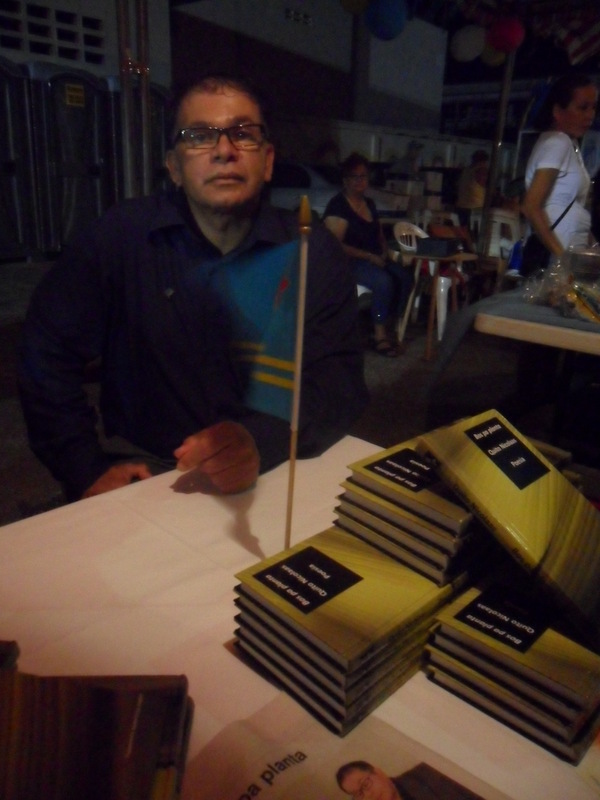 So we got family and friends coming by, but also people interested in literature and reading. 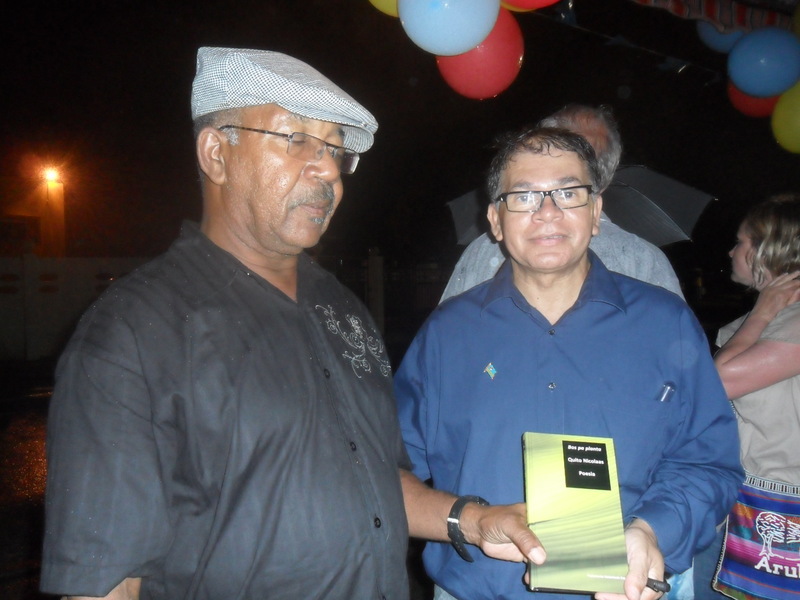 The only party pooper was the rain that spoiled part of the evening. 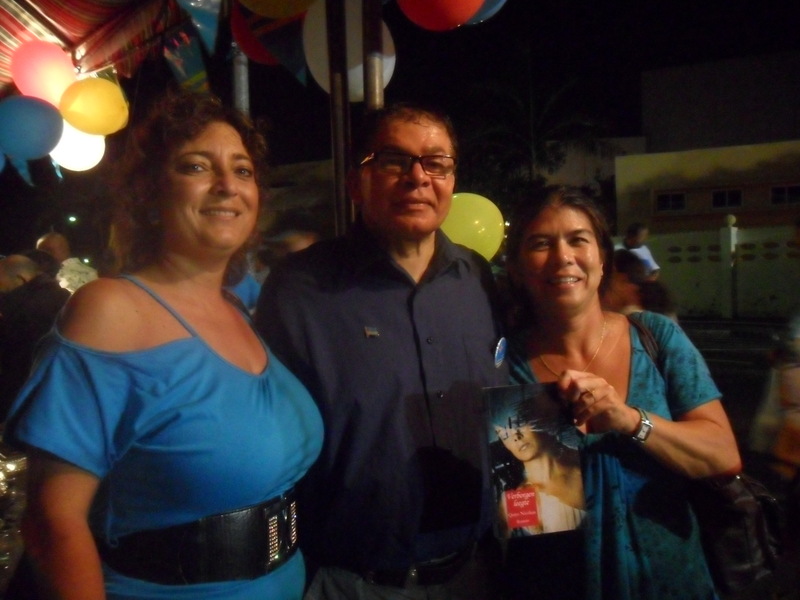 Here is a photo impression of the night. 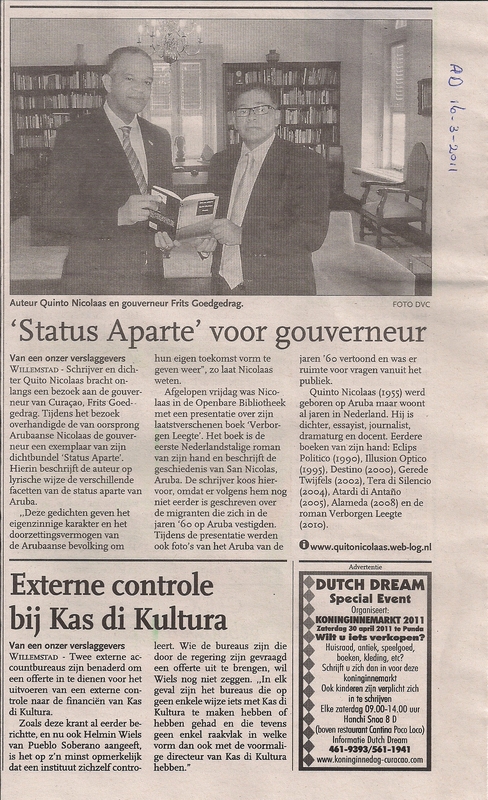 Last wednesday Quito Nicolaas was again signing his books at De Wit & Van Dorp Bookstores. 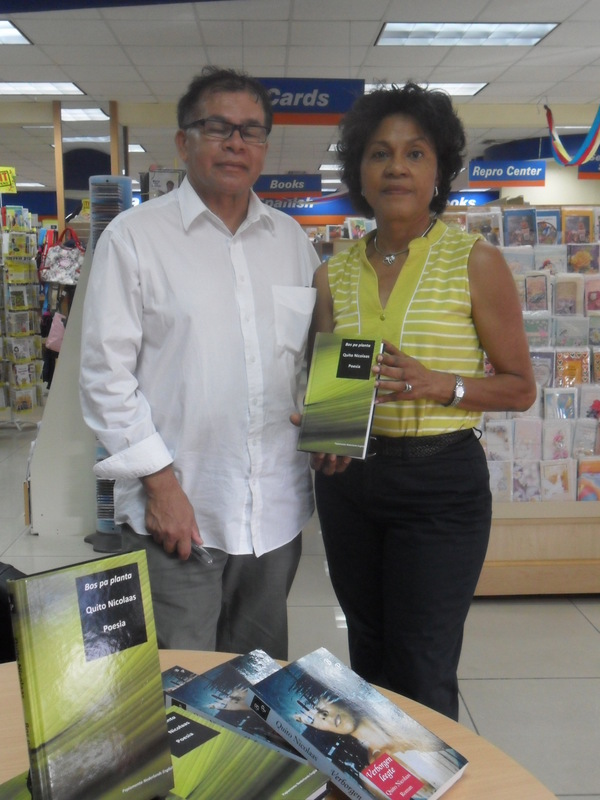 Book lovers came by to meet&greet the author and get their copy. 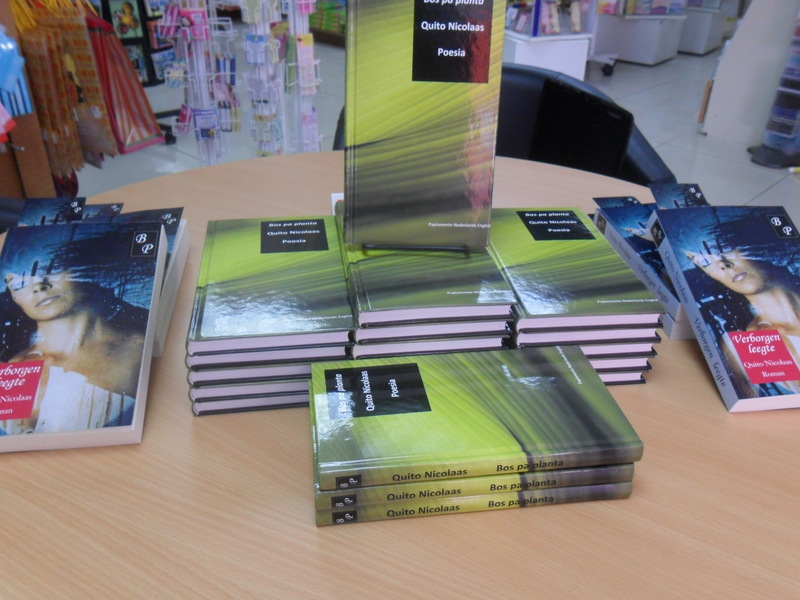 The greeting of the shop-assistants were as always very cordially. 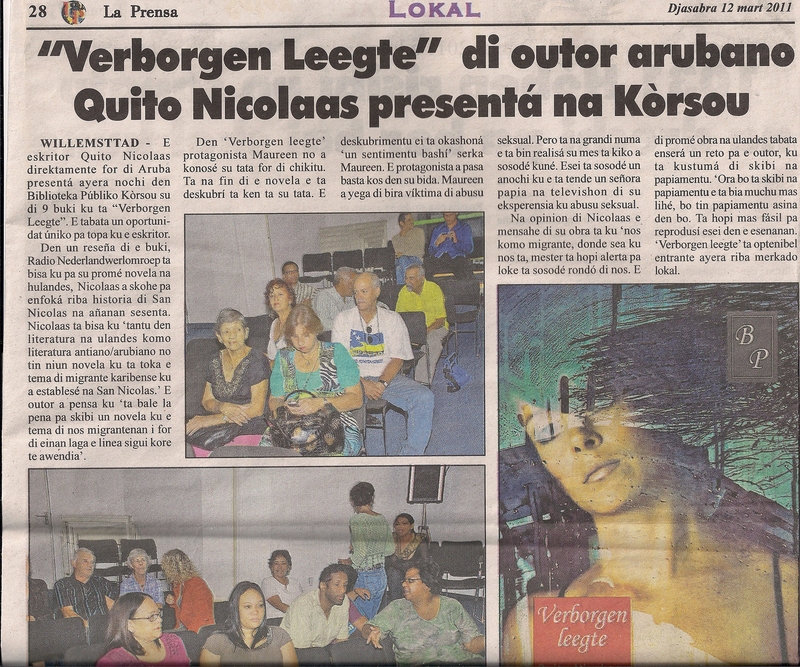 Both Bos pa Planta & Verborgen leegte are available @ De Wit & Van Dorp Bookstores, Avenida Milo Croes in Dakota.